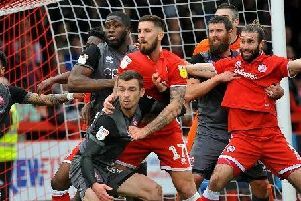 Crawley Town head coach Harry Kewell acknowledged his side weren’t at the races and lost out to the side which were more hard working. The Reds boss admitted Reds failed to deal with some great crosses which leds to two of their opponents’ goals. Town conceded three second half goals scored by Alex Reid soon after the break and two by former Brighton player Alex Revell. They managed one goal of their own which brought them back on to level terms early in the second half which was headed home by Alex Revell. Kewell said: “We weren’t at the races. Stevenage worked harder than us - we were a bit leggy. Kewell said he knew how Stevenage were going to play but they were unable to do anything about defending against the long ball game. He said: “Stevenage played a very direct game and they do what they are good at: long balls, flick-ons and look for silly little fouls. “We knew exactly what Stevenage would bring and that’s the disappointing thing.